Crucial plays from the Big Green defensive and special teams units paved the way for an 11-point halftime lead, topped off by a second-half offensive improvement, as the Big Green (1-0) convincingly defeated Georgetown University (1-2) 31-10. It wasn’t quite the dynamic offensive performance one might have expected from the football team, but that didn’t matter much in the team’s season opener against the Hoyas on Saturday. The result in Washington, D.C., made it six consecutive season-opening victories for the men, a streak which coincides with the program’s surge back to prominence over the last several seasons. Through its first two offensive drives, Georgetown found early success. Senior quarterback Kyle Nolan guided his team well in third-down situations in the first quarter, throwing for five first downs. Facing third-and-nine from Dartmouth’s 31-yard line, Nolan fired a pass deep down the middle to tight end Matt Buckman to open up the scoring at 4:57 in the first quarter. The Big Green floundered on its ensuing offensive possession, but the special teams unit stamped its mark on the game the next time it received a punt. Ryan McManus ’15, a 2014 All-Ivy First Team selection at both receiver and return specialist, weaved his way 63 yards up the field until he was brought down inside Georgetown’s 10-yard line. McManus’ return offered a key jump start for a stagnant offense, which wasted no time making use of its best starting field position on the day. Two plays later, Dalyn Williams ’16 took the shotgun snap, and feeling pressure from both sides, sprung forward and maneuvered his way into the end zone for a nine-yard touchdown rush. The quarterback scramble evened the score at seven with 2:27 left to play in the first quarter. The Big Green onslaught did not cease there. On the Hoyas’ following possession, Troy Donahue ’15 jumped in front of a Georgetown receiver and picked off Nolan near midfield, returning the ball 35 yards to the Hoyas’ 13-yard line. Gifted an excellent starting point for a second straight possession, the Dartmouth offense once again capitalized immediately. Brian Grove ’16 received the handoff from Williams and scampered down the right side for the score, granting his team a touchdown lead seconds before the conclusion of the first quarter. Within the first quarter of play, the opportunities generated by the Big Green defense and special teams helped offset Georgetown’s substantial advantages in first downs, yardage and possession time. Folarin Orimolade ’17, the lone junior starter on the Big Green’s experienced defense, had a particularly strong impact on Saturday afternoon. Coming off a 2014 season in which he led the team in sacks, Orimolade got a quick start to the new campaign — the linebacker brought Nolan down twice in the first quarter, added another sack in the third and had a QB hurry as well. He and Dartmouth’s other rushers increased the pressure on Nolan as the half wore on and threw a Hoyas passing game off that had looked formidable early on. The Big Green continued its strong performance on special teams in the second quarter. After Orimolade pressured Nolan into a failed third-down conversion forcing Georgetown to punt, McManus went to work again. This time, McManus only picked up 23 yards on his return, but represented a huge lift in setting up the offense at the opposing 34-yard line. The fifth-year senior would later end a stellar day on special teams with three punt returns for 102 yards. While that field position produced by McManus didn’t lead to points, it did help to pin Georgetown back to its own three-yard line off a punt by Ben Kepley ’17. Two plays later, as Georgetown desperately trying to get some offensive breathing room, one of the game’s defining blows struck. Sensing the Big Green rush, Nolan shuffled to his left while inside the end zone, and threw a pass batted into the air by Will McNamara ’16, who was eyeing the quarterback the entire play. The linebacker proceeded to bring down the interception and easily run into the end zone, extending Dartmouth’s lead to 21-7. Georgetown later engineered a scoring drive toward the end of the half, but could only tack on a field goal. Despite being outgained by 145 total yards, out-possessed by almost 16 minutes and having 11 fewer first downs, the Big Green remained ahead at the half, a testament to the well-rounded nature of the team — even though its supposed strong suit, the offense, had languished a bit. Within the first few drives of the second half, though, Williams and company came to life and established efficiency. 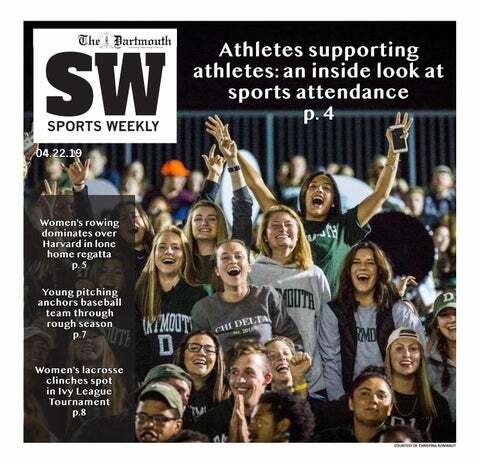 The opening minutes of the third quarter saw the Dartmouth offense execute its strongest drive of the game at the time, collecting four first downs and 72 yards, 50 of which came off the arm of Williams, who went 5-7 on the drive and had extra support from two backup running backs. Although the team stalled at the Hoya three-yard line and settled for a chip-shot field goal, positive signs for the offense abounded. The next time it received the ball, the Big Green sealed the game for good with an eight-play, 72-yard touchdown drive toward the end of the quarter, adding another impressive layer to a revitalized offensive display in the second half. But prior to a 27-yard connection between Williams and receiver Dylan Mellor ’19 for the score, McManus — who already had three receptions for 51 yards in the quarter — suffered an injury that took him out of the game. After the game, McManus said his ankle was rolled up on, but it was not serious. He also noted the progress made by the offense as the game went along. Though Georgetown still possessed an edge in first downs and total yards by the end of the contest, Dartmouth left D.C. with a comfortable 31-10 win. Notably, the Big Green had the better per-play offensive stats — 4.8 yards per play to the Hoyas’ 3.9 — as well as a critical +3 turnover margin. From the two interceptions to a goal-line Georgetown fumble in the fourth quarter, the turnover battle essentially resulted in a 21-point swing. Williams did not have the best of games by his lofty standards in going 17-28 for 138 yards, but the ground game excelled on Saturday. No single runner exceeded 43 yards, but between five different players — ranging from Williams to running backs of all graduating years — the Big Green had 145 rushing yards and two touchdowns at a 4.7 per-rush clip. Head coach Buddy Teevens said that the unusual first half flow had an effect on his offense, but he also noted how more chances with the ball in the second allowed the unit to settle into the game. This Saturday, the Big Green will head home to play Sacred Heart University in its first game in Hanover.